Facing nearly directly south, you can enjoy views like this in early April in the early morning hours. This night sky image is a composite of two photographs. The Milky Way was captured around 4am as it rolled across the sky. 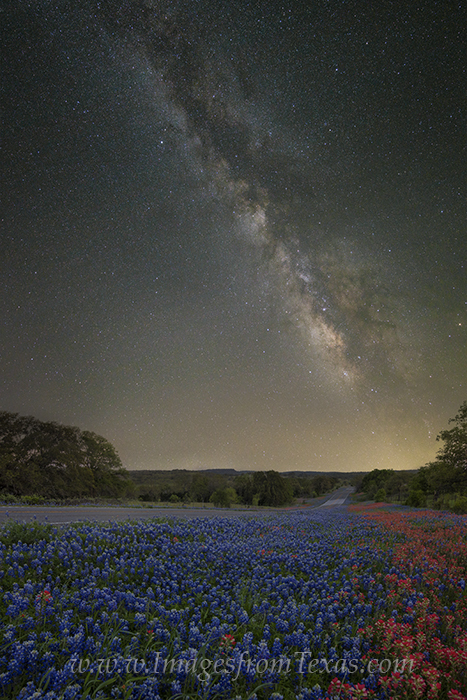 The Texas Hill Country Highway was taken just before sunrise as just enough light allowed for the definition and colors of the wildflowers to show up - much morese in this image than what my eye could see. I had to use a powerful flashlight to enable my camera to focus. The glow in the distance is the bustling town of Llano. Photo © copyright by Rob Greebon.